Easy to use professional confetti canon with ultra-violet confetti! Launches up to 1/2 pound of glow confetti at the press of a button. No C02 makes this very safe to use. The launch duration is 25 seconds and it has a throw distance of 30 feet which will give you a coverage area of approximately 540 feet. Super fun effect for parties! 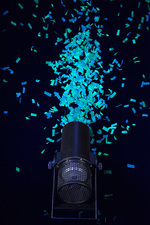 The rental of the Confetti Canon includes 1 pound of UV confetti which looks awesome for a glow in the dark party. Rent some Black Lights to activate the full effect. There is enough UV confetti included for 2 full launches (at 1/2 pound max per launch). You can use less confetti for each launch if you want to have more frequent launches, with just less confetti. UV Glow In The Dark Confetti Included! Please make sure to follow all of the instructions included with the launcher for safety. Indoor use only. DO NOT SHOOT CONFETTI DIRECTLY AT PEOPLE OR ANIMALS. STAND BACK 10 FEET FROM LAUNCHER. Do not load anything else into confetti launcher except for supplied confetti.